Get Lost in the Heart of the Byzantine Empire! Discover the breathtaking sights as you approach the city from land or sea, plus locales inside the imposing walls. A handy map points out major landmarks. Learn the history of this magnificent metropolis, from its early beginnings in the seventh century B.C. to its Ottoman conquest in 1453. It includes a timeline and GURPS City Stats descriptions for three iconic eras. Understand the apparatus of power that guided the city and empire to greatness, and how it was ahead of its time. Learn about the importance of the emperor and his household; the various civic, religious, and military officials; the relationship between the Orthodox Church and the state; and the spectacles used to keep it all together. Decipher the relative standing of various offices with a handy table showing equivalent GURPS Rank and Status levels. Get tips on how to fight battles with the Byzantine military and GURPS Mass Combat. Be introduced to several prominent political and cultural figures, with backgrounds, physical descriptions, and personality profiles. Get a glimpse into daily life: basics of the economy, family life, clothing, food, education, technology, sports (and other entertainment), and more. Note the adventure seeds throughout, providing exciting ways to insert Constantinople into your campaign. The city makes a destination for historical or pseudo-historical intrigue; it also works in countless crossover campaigns, including GURPS Banestorm, GURPS Dungeon Fantasy, GURPS Infinite Worlds, and more. Delve deeper using the extensive bibliography, including suggestions for appropriate music. 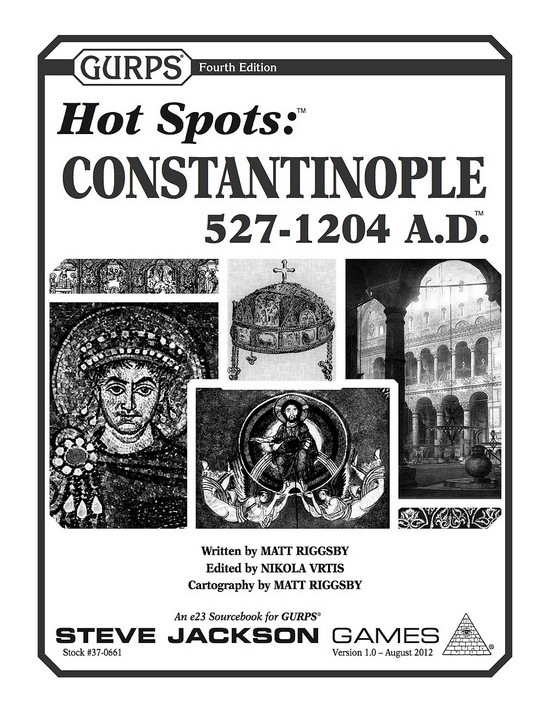 With GURPS Hot Spots: Constantinople, 527-1204 A.D., you'll discover a city that can only be described as iconic . . . in more ways than one! 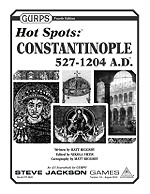 Check out the full GURPS Hot Spots line for more historical settings! For ready-made protective garb suitable for this setting – as well as a variety of other historical eras – get properly outfitted with GURPS Loadouts: Low-Tech Armor. Learn about the larger history of the Crusades, and how they intersected with – and permanently changed – Constantinople, in GURPS Crusades. For information on the western part of the Roman Empire, check out the Third Edition supplement GURPS Imperial Rome. For insight into the technology and techniques used in Constantinople, direct your scholars to GURPS Low-Tech and the three companion volumes.